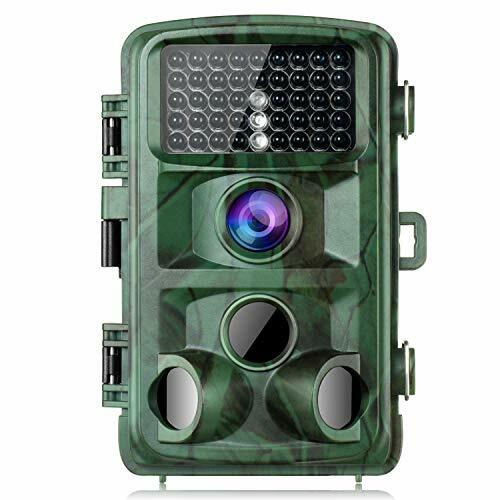 This trail camera captures 14MP that gives crystal clear photos and 1080P FHD in videos complete with clear sound recording. This kind of quality gives you extremely high-quality pictures. The camera also has a built-in 3PIR system with a 0.35 trigger speed sensor meaning each detected movement will be captured swiftly and precisely. With 120 Wide Lens and up to 22 meters/ 75 ft of night vision distance, these lenses will provide you a rather large scope in the field with its pictures. It has 42PCS low glow Infrared LEDs to make up the 75ft/22M detection capturing range. This, along with its 0.35 trigger speed makes sure that no movement will be missed when taking a video or a picture- even at night (with lower resolution), this ensures that any picture will provide the uppermost quality that it has. The camera itself is very compact- it has a nice camouflage design that will hide it from unsuspecting animals (and even humans). The photos taken by the camera is incredibly clear and with good quality, the videos have a high resolution as well. Also, being able to hear the recording is a nice touch. Although at night the picture can look distorted due to low lighting- this can be fixed by adjusting the camera. The images are good enough to identify the animal or person and capture the event, but they are not going to suitable for display and moderately useful to identify a specific person. As trail cameras are usually left in the outdoors for long periods. Whether it is rain or dust, this Toguard camera is capable of surviving harsh weather. It has an IP56 function, and the camera is very durable. This protective case can protect your trail camera from rain and dust damage even in tough environments. Remember, it is essential that your gear should be able to withstand any weather conditions. With the gifted mounting strap or mounting plate, it is effortless to install this trail camera sturdy. Setting it up is incredibly easy as its basic function is already set with ideal settings for the majority of wildlife applications, whether used on trails or nest sites. Although, it is still recommended for you to read the instructions thoroughly or even watch a video about it online as the instructions manual is a little hard to understand. You would only need 8 1.5V AA batteries (4 would work as a minimum as well) after over 1,000 pictures batteries are still 3/4 full. Also, you would need to insert a micro SD card(with a 32GB max, not included with the product) to use it. Switch it ON then it is immediately in standby. Standby mode would usually last up to 6 months. Be careful when inserting the SD Card, as its slot is rather small. The camera also has extra features that are incredibly useful. There is moon phase, temperature readings (F & C) in the pics & videos, and a playback monitor. You can also customize the settings, change the date and time and set up the camera to take still shots or video. Meaning, it can take pictures in a specific time frame. It is not recommended to set the settings in the camera to take photos and videos at the same time as this way will dry up the batteries very quickly then cause poor night vision image quality as infrared LEDs can not turn on with low voltage. There are also options to set the number of still shots the camera takes when motion is detected and the length it records video when motion is detected. Tripods can also be used with this product, although it is not included. It also has brackets that are compatible with straps. It provides a lot of support and stability thus producing clear and vivid photos and recordings instead of shaky and blurry outtakes. It is a great wildlife camera, straightforward to set up (defaults settings help), sensors work well (maybe too well), takes excellent daytime photos and good nighttime ones. There is an option to set time for photos which is also great. There will be some trouble figuring out how to set the camera up to the way you like it/the way your surroundings are, so night photos weren’t overexposed. Buying trail cameras can be expensive, and you want something that would last for a long time. The Toguard’s is designed for durability and adverse weathers. It is a good investment if you will be using it a lot. You need to avoid anything that will “catch” the nighttime light and over reflect it. It is recommended to move the camera a little to fix the problem. The side sensors help there to be sure you don’t miss a shot. The viewing screen works well, but if you use it a lot, it may decrease battery life. Overall, the camera does its job- features included. The cons can be a hassle, but with time, effort, and trial and error, the camera will work like a dream. There’s also the safety net that if the camera may not work – you can still get back your money’s worth by contacting the company.